A creamy side dish to add flavor and texture to your summer menu. 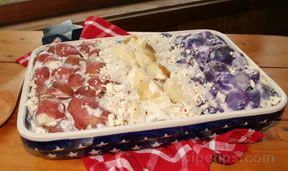 The baby red potatoes used in this summer side dish recipe have a sweet and tender flesh and are also called Red Creamers. See how to prevent potatoes from turning brown after being sliced. Boil potatoes in salted water for approximately 15 minutes or until just tender. Drain and allow to cool. 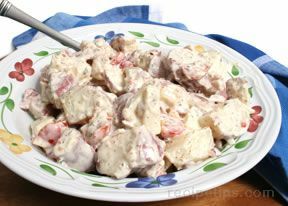 In large bowl, combine red onion, cherry tomatoes, bacon bits, basil, Italian drssing, mayonnaise, and mustard. Stir until smooth and combined. 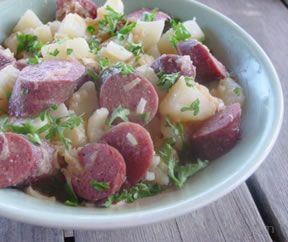 Add cooled potatoes and toss to coat. 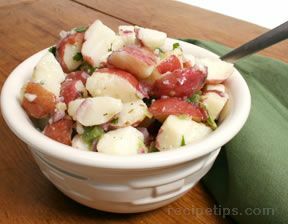 "Tasty change of pace for a summer potato salad."